Please fill in everything you think the community should know. On 9th July this content will be moved to http://wiki.openmoko.org/wiki/Community_Updates/July_9%2C_2009, FEEL FREE TO DO IT on 9th, also post a note on the community mailing list! Experimental QtMoko X4 - new QtMoko images that are based on debian and that now support running X application from Qtopia. You have to use QX launcher which will allow you to start X application in fullscreen. You can exit the application when you press the touchscreen for 5 seconds. The application will be then paused and you can either kill it or continue. The support for switching tasks between Qtopia and X application is still missing. OpenWrt - Mirko Vogt and OpenWrt team has released OpenWrt for the Neo/FreeRunner devices. They provide flashable images. Mind - that, as usual for OpenWrt - the default IP of your device will be "192.168.1.1" and the only running service will be <telnet> on port 23. After logging in and setting a password, <telnetd> is getting replaced through <sshd> (port 22). mqutIM - instant messenger for QtMoko. Only ICQ protocol is currently supported. 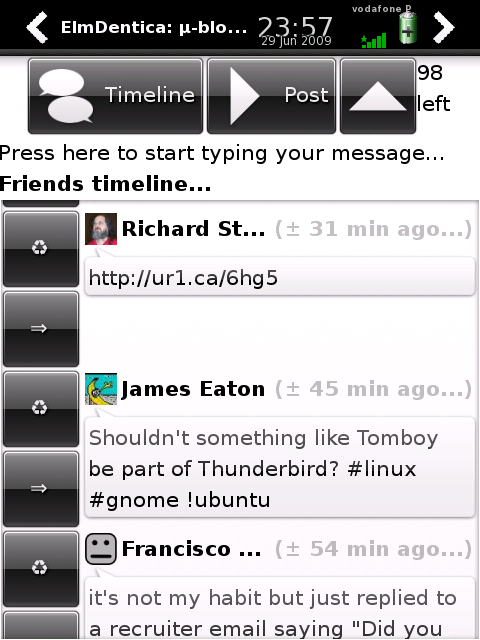 NoxChat - IRC client for QtMoko. Most important and change making mails on the mailing lists, blogs etc.. Coolest hacks, screenshots, themes etc..
On 2008-07-04, according to press release, Openmoko has opened it's online store for purchase of the Openmoko Neo FreeRunner. Thus this date is considered as official FreeRunner birthday day. Happy birthday FreeRunner! Kimaidou, author of Mokometeo, has created a google code page with a mercurial repository. Thus you all are encouraged to commit the improvements. David Reyes has uploaded the video made at Barcelona Buzz fix party and also made subtitles in English. Sure it can be improved but at least will let follow the conversations for those who are not familiar with Spanish. Pictures with comments of the last Buzz fix party on Madrid can be found here. 2009-07-25 The Debconf9 buzz fix party has been scheduled on Saturday. 2009-07-18 Linux meeting Beroun Czech Openmoko community meeting and buzz fix party in Beroun.